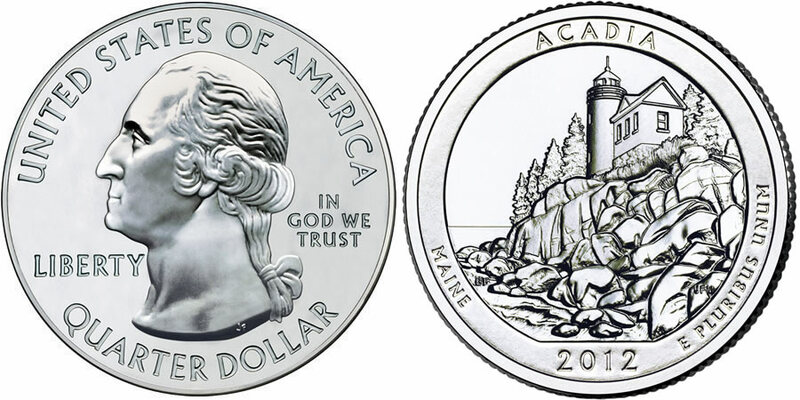 The 2012 Acadia National Park Quarter will be released by the United States Mint as the third of five coins to appear in 2012 as part of its America the Beautiful Quarters® Program. Shown on the reverse of the quarter will be a design emblematic of Acadia National Park located in the state of Maine. A total of fifty-six new quarters will be issued as part of the series which is scheduled to run from its debut in 2010 until 2021 at a rate of five per year. The strikes each honor a different site of national interest from around the United States and its territories as well as the District of Columbia. The quarters are released in the order in which the honored sites came under the direct control of the federal government. Acadia National Park was originally created as Sieur de Monts National Monument on July 8, 1916, it then became Lafayette National Park in 1919 and finally renamed Acadia in 1929. The park owes a large portion of its infrastructure to the philanthropy of John D. Rockefeller, Jr. who helped to finance many of the roads and bridges of the park. Shown on the obverse of each America the Beautiful Quarter is the same John Flanagan portrait of George Washington as seen on quarters, with some minor variations, since 1932. The portrait of the first President of the United States will be surrounded by the inscriptions of UNITED STATES OF AMERICA, QUARTER DOLLAR, LIBERTY, IN GOD WE TRUST. 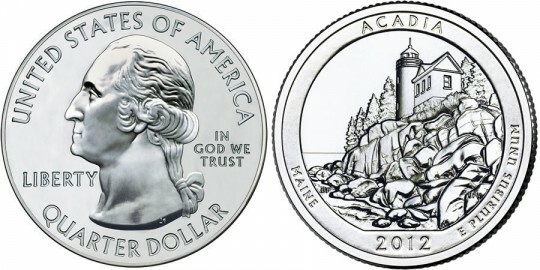 The Acadia National Park Quarter will feature a reverse emblematic of the national park. The chosen design showcases Bass Harbor Head Lighthouse on the characteristically rough coast of the park. The reverse was designed by AIP Associate Designer Barbara Fox and sculpted by United States Mint Sculptor-Engraver Joseph Menna. It will also include the inscriptions of ACADIA, MAINE, 2012 and E PLURIBUS UNUM.